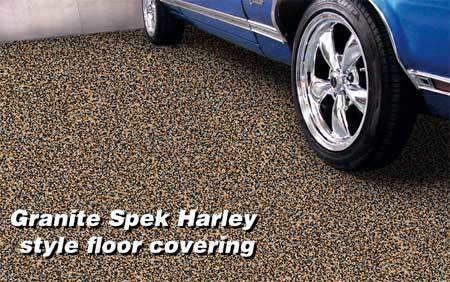 Garage floors come in a variety of styles colors and patterns. The least expensive and easiest to install of these floors is the roll out garage flooring also known as rubber floors. The leading manufacturer of roll out garage floors is Better Life Technology, LLC. Their floors come in four patterns: diamond tread, levant, coin and ribbed. Each flooring type has its own practical purposes but most people choose based on appearance. This type of flooring is available in various colors including absolute white, slate gray and midnight black. Other bright colors are also available on some floor patterns and models. Our newest G Floor brand is like roll-out granite flooring for your garage. 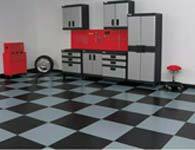 Experience the beauty of granite, or an epoxy type floor, with the ease of a simple to install roll out garage floor. If you are interested in a tile floor but would like the same materials used as in our roll out floors, you may want you consider our peel and stick tile floors. These are made from a thicker version of the roll-out floor material with an adhesive backing that allows for easy installation. Now you can enjoy the look of tile with the ease of simple to install roll out floor material. This entry was posted in Updates and General Garage Flooring News and tagged Garage Flooring, garage floors, roll out garage floor, roll out garage floors, rollout garage flooring, rubber flooring on July 8, 2013 by Store It Well Staff.